The most comfortable lace adjustable plate binding ever. The Nova binding comes in black with white logo and black plate. 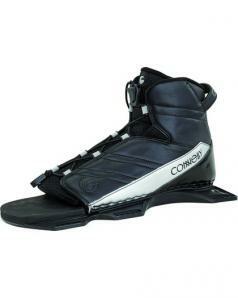 If you are someone who shares your ski with others, the Connelly Nova is the binding for you. This lace up the front binding is very versatile and will work for a variety of foot sizes. You can get the support of a high wrap binding along with comfort. 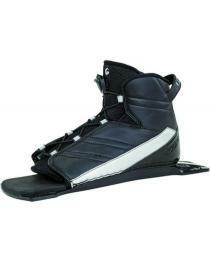 The floating toe rubber along with locking lace system makes this ski boot easy to get in and out of. You may buy 1 binding, or the pair which has both front and rear bindings.